Keith Ranville has come up with a differing translation from the generally accepted one. He is of native Canadian descent and has used his native background to find a message on the stone. The message concerns an island two islands to the east of Oak Island (Birch Island) which has a distinctive triangle carved into the north side of the island. which we obtained these photos), the triangles that were inscribed on the stone tablet refer to the triangle on Birch Island the rest of the symbols are engineering instructions or explain what goes on in the triangle area on Birch Island there is something of great heritage value there that will interest everyone." So, what is Ranville's Translation? So what is the answer to this mystery? Someone has obviously gone to great lengths to conceal some great treasure at Oak or possibly, Birch, Island. It is, apparently, too late to get to this treasure the easy way. When they found the flagstone they should have stopped and translated it but instead went on digging and broke the corks that let the water flood the tunnel system. And, according to Ranville, everyone is looking in the wrong place anyway. In ongoing correspondence with Ranville, this writer asked, "Where is the 'X' that marks the spot?" Ranville says, "I am looking forward to exploration. 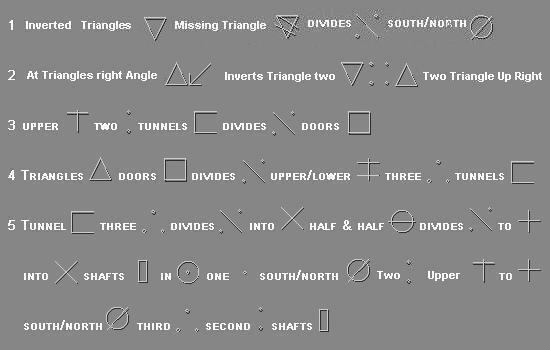 I am waiting for permission to explore the Island and I will be taking soil samples measurements etc.. [the] "X" spot would be at the right angle of the triangle what the symbols say. But field investigations are needed. These are exciting times for Oak Island." But what do instructions actually mean? One day, when technology catches up with the ancient booby traps built into the money pit, we will be able to take a look and see what was worth all the hiding and seeking. Some postulate that the pit contains millions (some say even BILLIONS) in UK pounds. Others have gone so far as to link the Oak Island Money Pit with Freemasons, Templars and .... The Holy Grail. Does the Holy Grail lie at the bottom of a deep pit in eastern Canada? Of course, it may be something of great historical and heritage value and not English Pounds and some monetary treasure at all. Anyway, one day, when someone rich enough, with enough time on his/her hands and clever enough to outsmart the designer of the money pit finally steps up to the plate, this writer hopes he is around to see what all the fuss is about!